Watch full Naruto Shippuden Season 20 Episode 34 English Dubbed full HD online. Naruto Shippuden Episode 447 English Dubbed online for free in HD. Naruto wakes up and is told by Shikamaru that Sasuke is nowhere to be found, and that the Anbu they were fighting retreated. While Tsunade updates Minato on the shinobi Sasuke attacked when he left the village, Shizune arrives with news someone infiltrated the village. Pain arrives and talks to Tsunade, vowing to cause the village pain. Pain attacks the village with a gigantic Chibaku Tensei. Naruto and the others arrive in the morning to find a crater where Konohagakure was supposed to be, with the Chibaku Tensei floating above it. Neji confirms the chakra of the villagers is inside it with his Byakugan. Naruto meets up with Sakura, who was away on a mission and is also puzzled by what happened. Sakura begins healing Naruto’s injuries, and Naruto uses the time to mould sage chakra. Inside the Chibaku Tensei, Minato discovers he can’t teleport outside. The Chibaku Tensei begins compacting, and Shikaku and Inoichi begin coordinating a strategy to protect the village from being crushed. 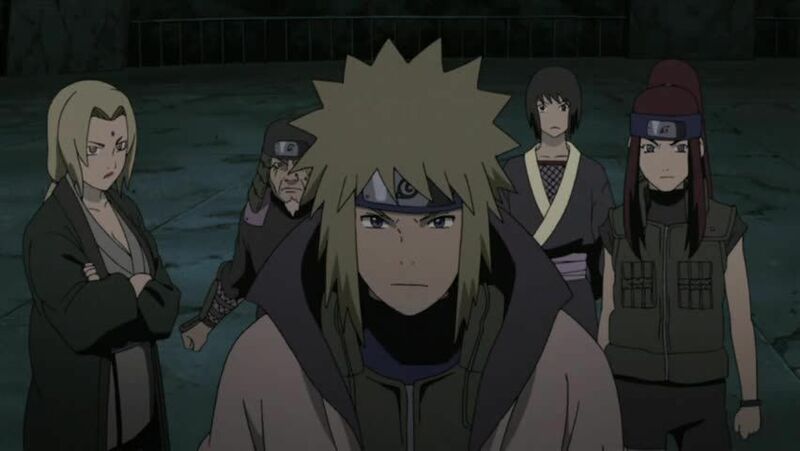 Minato asks Hiruzen, Tsunade, and Kushina to help him setting up a Four Crimson Ray Formation to counter the crushing and buy them some time. The Six Paths of Pain meet up with Naruto, who releases a shadow clone, and enters Sage Mode, and they begin fighting. Naruto manages to take out five of the six, but is pinned down by the Deva Path. Hinata comes to his rescue, but is struck down by Pain, causing Naruto to grow six tails. Pain traps Naruto inside another Chibaku Tensei.